Yes, LEDs are on the rise, but so are their various accessories. LED dimmers are increasingly popular, as they make a great light even better. But how do you know which dimmer to install with your LEDs? Dimmers programmed for incandescent or fluorescent lighting won’t work well with LEDs and may cause malfunctions and early failures. 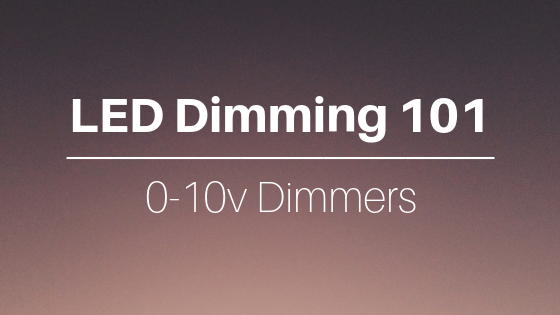 Today, we are going to look into 0-10v dimmers and how they have been adapted for LED lighting. 0-10 volt dimmers do just what they say: they offer a range of light from zero to 10 volts which produces a variety of light intensity. When dimmed to zero volts, your lights are still on, just at their lowest level. You will need a switch to turn your lights completely off. 10 volts is the maximum amount of light output. These dimmers were first manufactured for fluorescent fixtures and dimmed via the ballast. Now, they have been adapted to work with LED bulbs. When used with LEDs, dimming is measured in percentage, not voltage. So instead of 0-10v, the lights are dimmed between 0% and 100%. Yet, unlike when used with fluorescent lighting, many 0-10v dimmers used with LEDs can be dimmed completely off without the use of an extra switch. Make sure to ask your electrician if the dimmer will dim the lights completely off, or if an additional switch is needed before installing. 0-10v dimmers are most often seen in office and retail spaces, as they were most commonly used with fluorescent lighting in the past. However, they are now a great choice for your own home. They are also a great choice to install with outdoor commercial fixtures which may require more flexible lighting. Apart from the versatility of LED dimmers in general, there are added benefits when using dimmers with LEDs. They help extend the life of the LED, especially if they are dimmed often. The dimmer controls the amount of power sent to the bulb and when dimmed the LEDs use less power and therefore can last longer! This also means your energy bills will be even lower. Find the right LED bulbs and dimmers by talking with one of our experienced lighting consultants. You can call our main office at (319) 653-2123 or request a quote online!